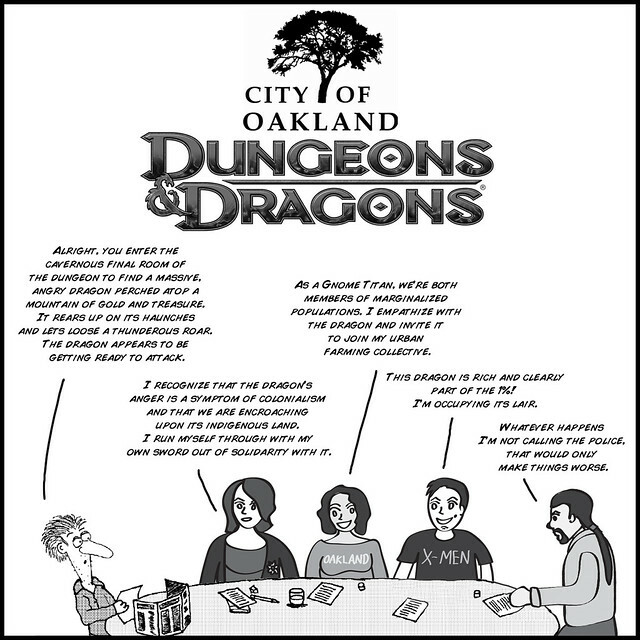 City of Oakland Dungeons and Dragons is an homage to my new home and the work of artist Jolly Blackburn. Jolly’s Knights of the Dinner Table is a comic series about a group of friends who play Hackmaster (an analogue to Dungeons and Dragons-and now a legit game unto itself). It’s a series that I’ve read for 15 years now, my longest streak in reading comic books. In this single panel piece my friends and I have uniquely Bay Area responses when being presented with the threat of a dragon. The character to the far left is B.A. Felton, the oft put-upon Gamemaster of the series. My secret artist dream is to illustrate a cover of Knights of the Dinner Table. They do take submissions but I have yet to put something together. One day soon!